1. President Pranab Mukherjee presented the Gandhi Peace Prize for 2014 to the Indian Space Research Organisation (ISRO) at a function in Rashtrapati Bhavan in Delhi. The annual Gandhi Peace Prize -- instituted by the government of India in 1995 on the 125th birth anniversary of Mahatma Gandhi -- is given to individuals and institutions for their contributions towards social, economic and political transformation through non-violence and other Gandhian methods. 2. Queen Elizabeth II becomes Britain's longest-reigning monarch later when she passes the record set by her great-great-grandmother Queen Victoria. The Queen will have reigned for 63 years and seven months - calculated at 23,226 days. The Queen is 89 years old. 3. Hungary's Defense Minister Csaba Hende resigned after a national security council meeting held to discuss the huge influx of refugees and migrants arriving in the country. Prime Minister Viktor Orban accepted Hende's resignation and appointed Istvan Simicsko, also a member of his Fidesz party as new Defence Minister of the country. 4. The seventh session of India-Belarus Intergovernmental Commission on Trade, Economic, Scientific, Technological and Cultural Cooperation was held in the Belarus capital Minsk. It was co-chaired by Minister of State (Independent Charge) for Commerce and Industry Nirmala Sitharaman and her counterpart Vitali Mikhailovich Vovk. In the session bilateral trade target was set as 1 billion US dollars to be achieved by 2018 from the present level of 400 million US dollars. 5. Union Cabinet approved a new Sovereign Gold Bond Scheme and also a Gold Monetisation Scheme to incentivise people to park their gold assets in a paper format and earn interest, while seeking to productively use vast amounts of this idle metal in the economy. Under the gold bond scheme up to 500 grams worth of bonds per annum can be bought by an individual with lock-in of five-seven years and appropriate interest so that they are protected from volatility. The Gold Monetisation Scheme, also approved, calls for people to deposit their gold with authorised agencies for a short-, medium- or long-term periods, for which they will be given certificates of holding. This will also bear interest. This has been done to replenish the Reserve Bank's gold reserves. 6. According to Moody's Investors Service India's current account deficit is likely to remain low supported by declining oil prices but a slow recovery in industrial output and investment would drag economic growth to 7 per cent in the current fiscal. Moody's also lowered growth forecasts for many Asia Pacific (APAC) sovereigns. It has reduced its projections for India to 7 per cent in 2015 and 7.5 per cent in 2016, from 7.5 per cent and 7.6 per cent based on high frequency indicators suggesting that the recovery in industrial output and investment is slow, and bank credit growth still subdued. 7. Indian weightlifter Deepak Lather won a gold medal in the 62 kg category of the 2015 Commonwealth Youth Games (CYG) being held in Apia, Samoa. This was India’s second gold in weightlifting after Jamjang Deru (17-year-old) who won a gold medal in the 56 kg category on the opening day of the event. 8. Bollywood actor Anupam Kher has been presented with the “Honoured Guest” award by the U.S. state of Texas for his contribution to cinema and art. 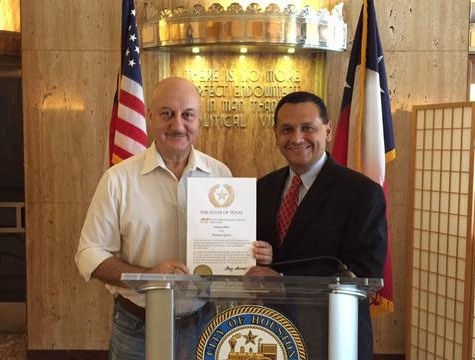 The 60-year-old actor was honoured by Deputy Mayor of Houston Ed Gonzalez on behalf of Texas Governor Greg Abbot. This honour comes just days after he was conferred with a “Senate Proclamation” by The Texas State Senate. 9. Haryana became the second in the country after Rajasthan to fix the minimum educational qualification for elections to the Panchayati Raj institutions. The Haryana State Assembly passed a bill – the Haryana Panchayati Raj (Amendment) Bill, 2015, for fixing the minimum educational qualification for elections to the Panchayati Raj institutions. The Bill fixed, matriculation as essential qualification for general candidates contesting the Panchayat elections while the qualification for the women (general) and Scheduled Caste candidate will be middle standard (VIII). However, in case of a woman candidate belonging to SC category contesting election for the post of Panch, the minimum qualification shall be V pass. 10. India's Ruthvika Shivani Gadde and Lakshya Sen clinched the women's and men's singles titles respectively at the Sushant Chipalkatti Memorial India Junior International Badminton Championships in Pune. Top seed Ruthvika thrashed Thailand's Supamart Mingchua, seeded second, 21-9 21-6 in just 26 minutes, while sixth seed Lakshya beat compatriot Chirag Sen 21-18 21-15 in a 27-minute clash.